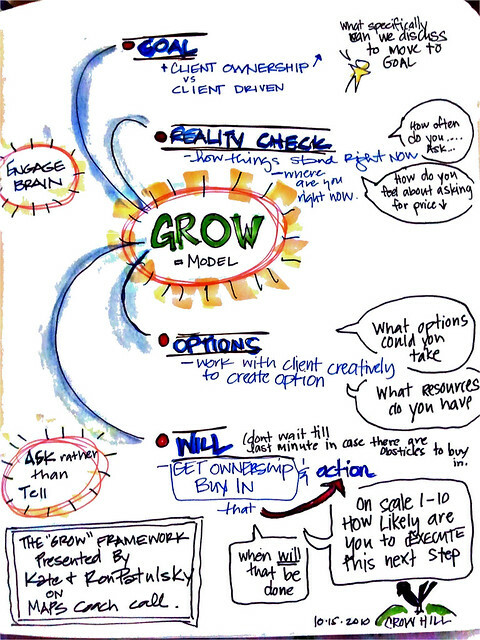 There are a number of different versions of the GROW model. This version presents one view of the stages but there are others. The 'O' in this version has two meanings. G Goal This is the end point, where the client wants to be. The goal has to be defined in such a way that it is very clear to the client when they have achieved it. R Reality The Current Reality is where the client is now. What are the issues, the challenges, how far are they away from their goal? O Obstacles There will be Obstacles stopping the client getting from where they are now to where they want to go. If there were no Obstacles the client would already have reached their goal. Options Once Obstacles have been identified, the client needs to find ways of dealing with them if they are to make progress. These are the Options. W Way Forward The Options then need to be converted into action steps which will take the client to their goal. These are the Way Forward. As with many simple principles any user of GROW can apply a great deal of skill and knowledge at each stage but the basic process remains as written above. There are numerous questions which the coach could use at any point and part of the skill of the coach is to know which questions to use and how much detail to uncover.